Produktinformationen "STRAY CATS - Live At Montreux 1981 DVD"
When the Stray Cats rolled into Montreux in July 1981 they were one of the hottest properties around. They had 3 hit singles and a UK top 10 album already under their belts along with a string of headlining concerts, all of which had come since their relocation from New York to London in 1980. The band's combination of original songs and rockabilly classics with a punk attitude and style had caught the moment to perfection. Added to this were their considerable musical accomplishments and knack for songwriting. All in all it was a heady concoction and the crowd in Montreux reacted with near hysterical excitement, something rarely seen in what is usually a polite and reserved audience. This is the Stray Cats at their peak. Simply unmissable. 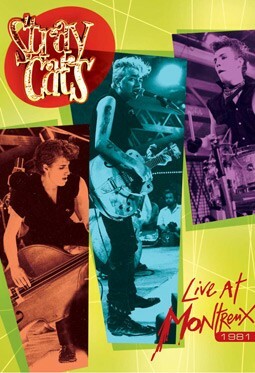 First ever DVD release of Stray Cats material from their heyday in the early eighties. Features their huge hit singles "Stray Cat Strut", "Rock This Town" and "Runaway Boys" plus many other classic tracks. Featuring, of course, the line-up of Brian Setzer (guitar & vocals); Lee Rocker (upright bass & vocals); Slim Jim Phantom (drums); this is the Stray Cats at their peak. Simply unmissable. Weiterführende Links zu "STRAY CATS - Live At Montreux 1981 DVD"